Our customers come to us because there is a special need or a special issue. We try our best to resolve the kitchen or bathroom design problem they are having and provide service that is both personalized and affordable. Here’s what our customers have to say about their experience with Del Rey. My wife, Susan and I, have been customers of yours for a few years since our multi-phase home remodeling project began. The first phase included our guest bath and master bath and this current portion included the kitchen, laundry room and powder room. The results exceeded our expectations and this can be attributed to the education and guidance we received from Becky and Trey, supplemented on occasion by Frank and Carlos. Each time we visited your showroom, we were greeted by Becky and Trey with the utmost of courtesy and professionalism. They possess a high degree of product knowledge along with matching business ethics. There were a few occasions over the last two years where our handshake was considered as binding as a deposit and because of that, we didn’t feel a need to compare your ‘competition’. 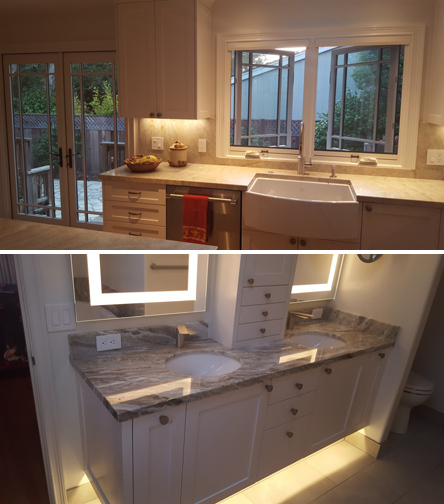 Our general contractor, along with our first plumber involved in the installation, also have a very good working relationship with Del Rey Plumbing which minimized the stress we encountered during the remodeling. We will continue to highly recommend you to our friends whenever their needs call for your services and products.